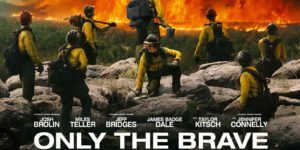 Is based on the true heroic story of the Granite Mountain Hotshot Firefighters in Yarnell, Arizona and on the GQ article “No Exit” by Sean Flynn. You will learn about the events that happened to 19 firefighters who died in 2013 while fighting a fire that’s one of the worst in our nation’s history. The film is a dedication to their memory. Josh Brolin stars as Eric Marsh, the ‘supe’ of the crew, (in an outstanding performance) he’s a long-standing member of the Prescott fire department in Arizona who has been trying for quite some time to acquire an elite ‘Hotshot’ classification for his crew of wild-land firefighters. The ranking will allow him and his crew to fight on the front lines of the fire. We see his frustration, as this is not an easy task. We are also privy to the strain it causes in his marriage to his wife Amanda, (Jennifer Connelly), whom also gives a tremendous emotional performance. We see Brolin dream of the fires he fights, letting us know that he’s in tune with the fires he and his crew battles. He speaks to them in a low whisper as if the enemy, trying to decipher their next move. Supe is also a father figure to the new hire Brendan McDonough played by Miles Teller nick-named ‘doughnut’ a recovering drug addict and soon to be father. The Bottom-Line? I’m in, this is the story of true heroes at work in a grueling job with insane hours. The cinematography is so realistic as times you will be uneasy as the fire appears to be so close to the actors. Outstanding performances by Brolin, Connelly and Teller.